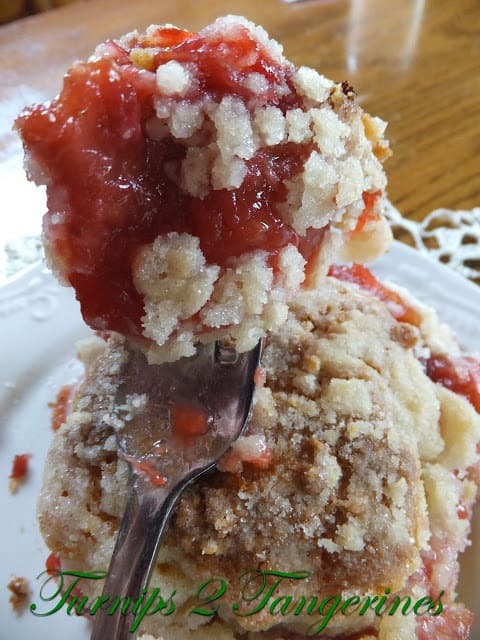 Rhubarb Strawberry Coffee Cake is a real family favorite. We love the combination of tart rhubarb and sweet juicy strawberries. Rhubarb and strawberry are meant for each other. It’s a match made in heaven. This recipe also calls for buttermilk or sour milk. Instructions on how to sour milk are given below. Don’t worry, it’s super easy to do! Now on to the recipe but first some rhubarb information. There are many varieties of this extremely tart fruit/vegetable. Most of rhubarb fall into two basic types, hothouse and field grown. Hothouse rhubarb is distinguished by its pink to pale red stalks and yellow-green leaves, whereas field-grown plants, which has a stronger flavor, have cherry red stalks and green leaves. Hothouse or field grown, either kind is the right kind! Rhubarb freezes super, so buy extra and get chopping. Hothouse rhubarb is available from December to March, while the field-grown rhubarb can usually be found from March to October. The peak from season is from April to June. Choose crisp stalks that are brightly hued. The leaves should be fresh-looking and blemish-free. Highly perishable, fresh rhubarb should be refrigerated, tightly wrapped in a plastic bag for up to 3 days. Wash and remove leaves just before using. In a medium saucepan combine; rhubarb, strawberries, water, lemon juice and lemon zest. In a small bowl combine, sugar and cornstarch; add to the rhubarb mixture. Cook and stir 4 to 5 minutes or until thickened and bubbly, stirring constantly. Use an immersion blender to blend together. Set aside to cool. In a large bowl, stir together: flour, sugar, baking soda, baking powder and salt. Cut in butter until mixture resembles fine crumbs. In a small bowl combine the eggs, buttermilk or sour milk and vanilla. Add to flour mixture, stir to moisten. Spread half the batter in a greased 13 x 9 baking dish. Spread cooled rhubarb-strawberry filling over batter in pan. Spoon remaining batter in small mounds over filling. In a small bowl combine, 1/2 cup sugar and 1/2 cup flour. Cut in 1/4 cup cold butter, until mixture resembles fine crumbs. Stir in chopped walnuts. Sprinkle crumb mixture over batter in pan. Bake at 350º oven for 40 to 45 minutes or until golden brown. Place 1 tablespoon lemon juice or vinegar in a glass measuring cup. Add enough milk to make 1 cup total liquid; stir. Let mixture stand for 5 minutes before using. 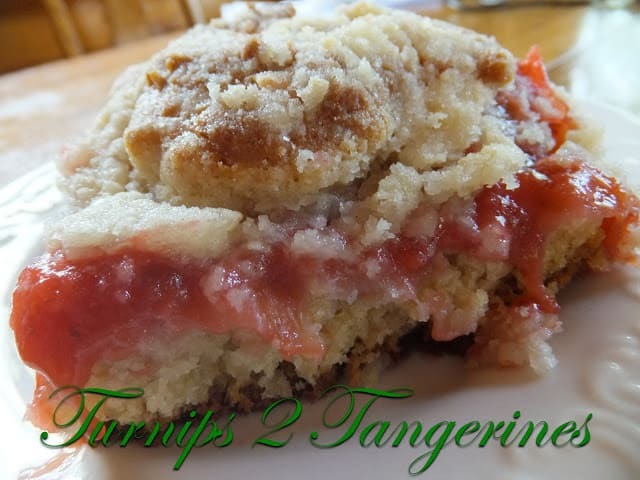 *Here is another fantastic recipe to try: Rhubarb-Strawberry Bars. 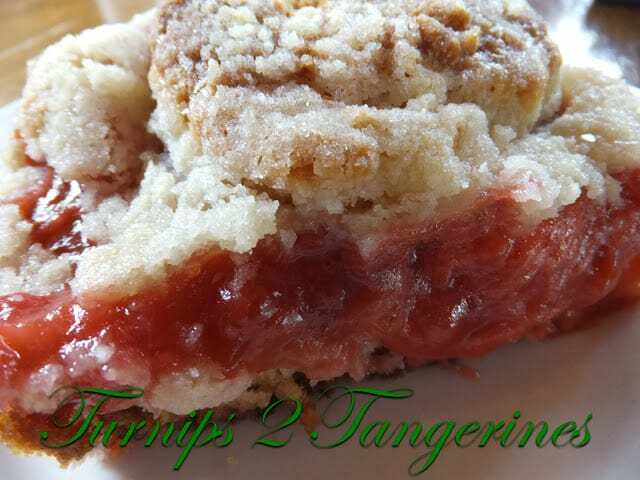 *Left over rhubarb-strawberry filling can be frozen. 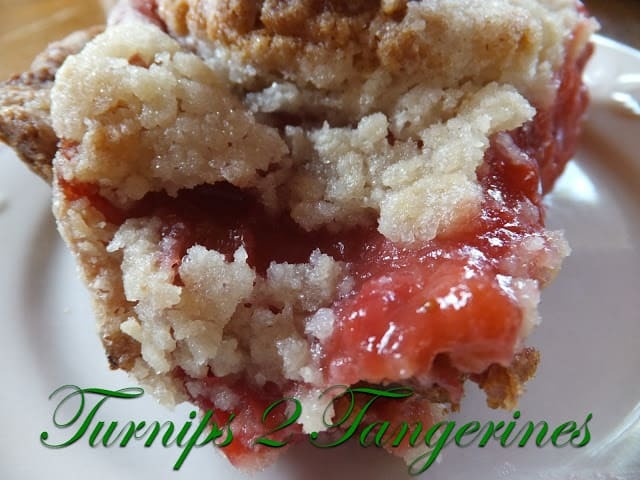 *To use, thaw frozen filling and use in any of your favorite rhubarb or rhubarb-strawberry recipes. 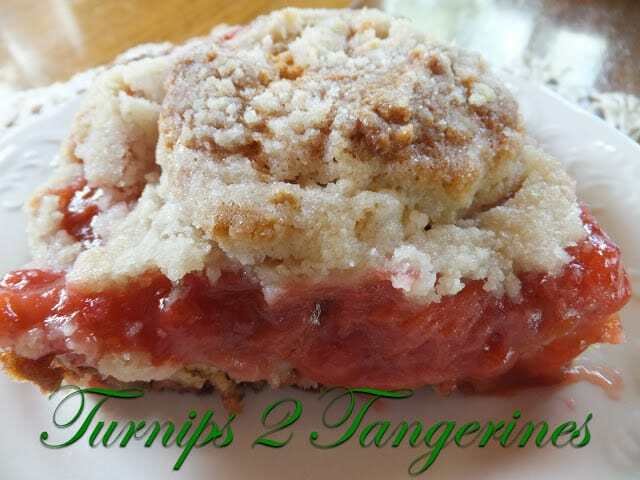 *Follow this recipe and make your own Rhubarb Strawberry Filling. That looks super yummy! found you from the Ducks in a Row blog hop. What a fantastic crumbly delicious idea! Rhubarb isn't something we have around here. But when I lived in the Midwest,it was everywhere! I tried strawberry rhubarb pie, but I've never seen coffee cake. Looks good! Thanks for linking, Lynn. Mmm.. Love your blog!! Thanks for linking up with us at One Sharendipity Place this weekend! to be honest I never eat rhubarb before, I come from Indonesia, seems not famous there. But now I live in Germany, I find rhubarb everywhere in supermarket. thanks for the recipe! Sounds amazing! I love coffee cake! Thanks for sharing at Sweet & Savory Saturdays #15. Oh, it looks delicious! I haven't seen rhubarb in our stores yet but next week the first farmer's market of the season will open. I can't wait!